Q. Congratulations. How do you think you have succeeded to turn this match around tonight? RAFAEL NADAL: Thank you very much. Well, I think he started playing aggressive, very, very high level at the beginning of the match. Always you can do a little bit more, no? But I really felt that when he plays like this, it's almost impossible to rise there to that level, no? But after the first three games I started to have the chance to hit balls, to play with a little bit with my rhythm, so I started to hit a few good forehands so I felt that the point stays. So before one shot winner, another shot winner, so almost impossible for me, no? After that moment I felt that the level start to be closer and closer. I had the break in the 42, and for the rest of the set I think anything can happen. I felt at the end of the first set that my level was there, close to him. For moments I felt dominant at the end of the first set. That gives me confidence. You know, finally I lost the set, but even the first game of the second that he had the break he was playing with the wind in his favor, so he played fantastic game, first game of the second. But that moment was a little bit more calm, because in just the first game of the second set I felt that I had chances on my returned, too. So was very important to have break back in the next game. But in general, after that I think I started to play aggressive. I started to play my game finally. I had the chance to move him a little bit more. Open the court from his forehand after changing to his backhand. I didn't play as I played hundreds of times against him. I didn't play all the time against his backhand like I did a lot of times. Today I think I played more normal match, playing in his backhand, playing in his forehand, too. I really wanted to do that before the match, because I felt that in the last match against him in London he played very aggressive with his backhand, so he was very inside the court. Was very difficult for me to find, you know, spaces to move him, no? Even the final of Roland Garros, the same. He played more aggressive with his backhand. On clay is different. You have more time. But today went on court with the idea change a little bit more the direction against him, and in my opinion it worked well. Because I think he was a little bit tired. Q. When you're in a match like that and he has started so well, can you draw on your experience to having beaten him now so many times in Grand Slam matches? Can that be an inspiration for you even when he's playing well? RAFAEL NADAL: Any moment is different, and what happened in the past is past. Last match against him was 63, 6Love in 50 minutes. Q. That's not a Grand Slam. RAFAEL NADAL: Not Grand Slam, different conditions. What give me more calm is I play best of five. I play not indoor. I play outdoors. That's always a little bit more advantage for me, because when you play indoor, when you play best of three, he plays aggressive. Is very difficult to come back when he start like this, no? Playing best of five outdoor, you normally have more time to do things and to try to find solutions and on the problem that he's causing, no? So in general, I am happy about how I did. I think I played a good match with some mistakes, as usual. But I tried to play aggressive with my forehand, trying to hit winners with my forehand. I did for moments. For moments I had few mistakes with the backhand. But I am trying with the backhand to not go behind the baseline, to stay in the baseline, to hit the ball earlier than before. That's something that I am working on and something that we believe that I have to keep improving, to don't lose court, to play more inside. It's working well. I a, very happy about my result on these two weeks. I did much better than what I thought, what I dreamed for three weeks ago. So very happy for everything. It's a fantastic victory for me. Very, very happy playing against the greatest of the history in semifinals, big match on Rod Laver. It's one of the victories that's gonna stay in my mind forever, no? It's a fantastic way to start the season. Very happy for everything. He deserves to be there because, in my opinion, he was a little bit unlucky for the last year and a half in a few matches. He was a little bit unlucky in the quarterfinals of Wimbledon; a little bit in the semifinals on the US Open. So he had the chance to win more Grand Slams the last year and a half, and he lost a few matches that he really had chances to win. Today he had his chances, too. So the match was close. Anything can happen there. I won. Q. You celebrated like it was a final. Did it feel like that to you? RAFAEL NADAL: No. Didn't feel like that. I feel like semifinals match of Grand Slam. That's a very important match for me. Start the season with the final here is a fantastic start, and that's give me a lot of confidence. That's give me a lot of calm. At the same time, that's give me confidence about how I working. You know, I working in few things that are working well. With nothing of practice, just thinking a little bit about what we have to do to be better player. I really didn't had the chance to practice a lot. I practiced one week and a half in Mallorca. Seriously, Doha was a very important tournament for me. Qatar I think I played very, very well there, because I arrived without preparation. Play four matches there was decisive to my preparation for Melbourne, no? So was a very important tournament. And for the rest, just these kind of matches actually better like this, because I played not bad the second half of the season in 2011. Not bad, but not very well. So I really need to win points to stay in the top positions of the ranking. Because the final of the US Open give me calm, yes. But for the rest I had a few struggling results in Masters 1000. That's a lot of points for me. It's a fantastic way to start the season. Q. I guess the question is whether or not you feel like you're playing aggressive enough with the forehand and more inside the court with the backhand and feeling calm enough if you have to play Novak this time to get over on him again. 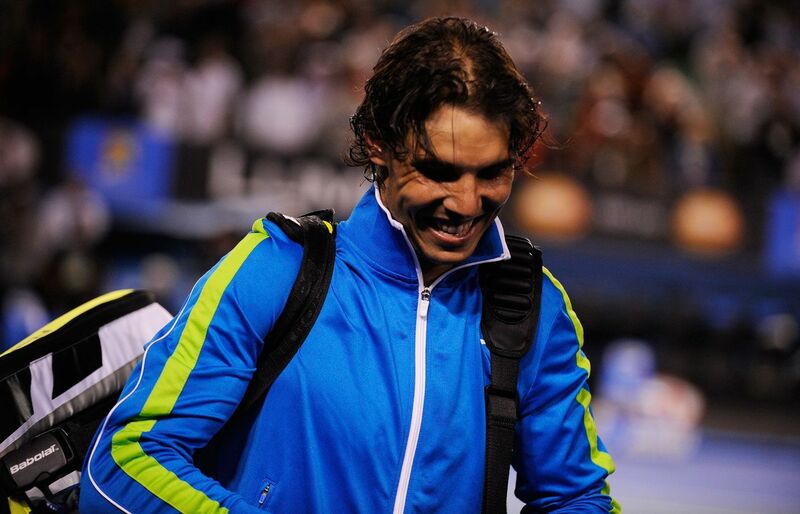 RAFAEL NADAL: Yeah, I happy about how I am doing. Any time to do this during all the match, as I am doing for moments for moments I am playing a little bit like before  but when I am able to play inside, to play aggressive, I think the things are working fantastic. I don't know if it's gonna be enough against Novak or against Andy. But what can I say? I'm very happy about my tournament. I gonna try my best to try to play a fantastic final, and hopefully I will have my chances. But if the opponents play better than me and he beat me, I gonna go home very happy about my tournament. I gonna go home knowing that the way that I am working is working very well, and keep working on this way. Probably this way give me a good success in the next months. Q. You said when you were interviewed on the court that if you were told before the tournament that you had made the final you would not believe it. Is that because of the injuries you have had or what? RAFAEL NADAL: Well, I explained before the tournament. I explained that after my match on the first round of Monday, not what happened the Sunday before on my knee, something very strange. But that's why, because Sunday afternoon, 24 hours to play my first match, I was in my room crying because I believe I didn't had the chance to play Melbourne. So it was a very, very tough situation for me, these hours. Two weeks later I am here in the finals, so is a dream for me because having very bad expectations 24 hours before the first match, and now two weeks later I am playing well. I am in the final. Always play Grand Slam final is very good news. I played last four Grand Slams I have been in the finals, so is a great effort, I think. Q. How is that knee feeling? RAFAEL NADAL: I am feeling great. No problems. Q. Do you think having the extra days to recover on the final will be a big advantage for you? Having the extra day advantage for the final? Your opponent plays tomorrow night. RAFAEL NADAL: I am fine physically. I believe that they are strong. They are feeling very well, very fit, so not gonna be decisive, no? When happens like the US Open that you play the day before, yes, because if you have five hours match, four hours 30 match, next day you can be destroyed physically, no? But one day in the middle, if it's not something very, very crazy, you will not have problems. I had that four hours 30 match two nights ago. I was in perfect condition today. So you can have a tougher match, yes, but four hours and a half is a lot. The recovery is very good, and they don't have problems on that, no? If you play a match like I played in 2009 against Verdasco semifinals, maybe yes, you can have a little bit troubles for the final. But that's something not usual. Q. Roger says he has the impression that you play your best tennis against him. Do you have that impression, as well? RAFAEL NADAL: I think sometimes. London I didn't play my best tennis. I play my best tennis against him when I am ready to play my best tennis. I don't play my best tennis because it's Roger in front. I play my best tennis because I am ready to play my best tennis. That's what I can say. Normally when I play against Roger it's because I am playing my best tennis because I always was in a finals or was in a very important matches, and having a good confidence because I have won a lot of matches before. It's true I played a lot of good matches against him during my career, so is something fantastic. But I believe that he played a few fantastic matches against me too during his career, during our rivalry, no? So I enjoy playing against him. It's always a special feeling because our matches always have been special, and especially today after a lot of ones, a lot of important moments for our careers. So our relationship always have always been in a very positive way. So for all of this facts our matches are special, no? I think hopefully we will repeat soon. Q. Would you rather play Andy in the final than Novak? That's what I can say, no? Q. What are your thoughts on the other semis, and how closely will you watch that match having in mind Andy changed his coach and Djokovic had so much success against you last year? RAFAEL NADAL: Both players are top players, very, very high level. The level of tennis of both players is fantastic, so gonna be a fantastic tennis match tomorrow. I gonna watch the match, because it's gonna be a fantastic show, my opinion. Both are playing very well. Novak has the advantage that he won the last two Grand Slams. He's No. 1 of the world. He's coming with big confidence. But Andy is doing really well. Only lost one set at the first match of the tournament. After that, he won all the matches you cannot say easy, because nothing is easy but with very comfortable result. So when you win with a comfortable result, it is because you are playing well. That's true. So both players gonna have chances. The player who will play better tomorrow gonna be the winner.